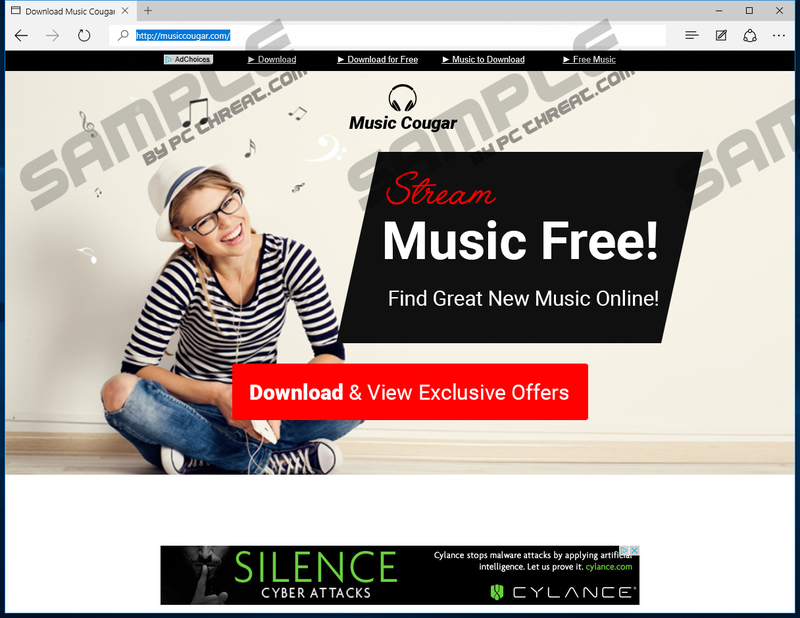 MusicCougar is an adware program that must have entered your system uninvited. Such applications often look like they could provide users with something useful, but that is not the case with the program we are dealing with here. As you can tell from the category, MusicCougar is closely related to online advertising, and it is highly unlikely that the application will provide you with useful services. Therefore, it is in your best interest to remove this program from your computer, and then secure your system against similar infections that might lurk just around the corner. Please do not forget that your computer’s security is your utmost priority. The official website for the application is located at musiccougar.com. This somewhat proves that the program is not a malicious infection, but we do not think that the official site plays a significant role in the program’s distribution. In fact, adware programs make use of other distribution methods to spread around the Internet, and the direct download is hardly something that makes waves. The point is that during our research we have found MusicCougar usually comes from download offers or from modified search results that users click during their web search sessions. This sheds a spotlight on another problem. If your search results have been modified, it means that you most probably are infected with a browser hijacker or some other potentially dangerous program. Thus, one dangerous program lures in another one, and it is not in any way surprising because trouble never comes alone. What’s more, MusicCougar may also come bundled with freeware applications. When you look for a particular program online, if this program is distributed for free, you should download it from its official website, ignoring all the third party offers. Third party file-sharing websites promote freeware application via third party installers that at least several programs within. Usually, users are informed about the additional software that comes with the program they have been looking for, but it is quite often that they go through the installation wizard skipping important steps and missing the information on additional programs. As a result, the likes of MusicCougar manage to enter target systems without much difficulty. It simply follows the footsteps of its predecessors and does whatever NewsCert or Moneyzila have done before. The program makes use of the InstallCore downloader, and it comes with additional offers. For example, if you have MusicCougar on your computer, it is also very likely that you have Search Know, Sweet-page.com, MyPCBackup, Yousearching.com, System Healer, and other malicious and dangerous applications. It should be pointed out that the additional software that comes with the adware program may differ from region to region. Once the program is installed, you can expect an onslaught of commercial advertisements that will be, in one way or the other, related to your likes and preferences. Adware programs track your web browsing history to find the most frequent queries and keywords that you use to search for information on the Internet. If you were to run the program yourself, you would get a new window with the image of MusicCougar at the top of it. The program loads the musiccougar.com/redir.php website and then offers you to visit Last.fm or Grooveshark. Aside from that, it also launches a new browser window with additional commercial offers. On top of that, the application may redirect you to online casino sites, surveys, and so on. There is no guarantee that the information promoted by these additional windows is safe. It is far more likely that the windows will be full of outgoing links that lead you to corrupted websites. Although MusicCougar does not intend to infect you with malware, this possibility remains, and if you fail to delete the program from your computer, you will eventually face a malicious infection or a financial fraud that could leave you penniless. To uninstall this application from your computer, go to Control Panel and delete it just like you get rid of any other program. Luckily, all the files and registry entries associated with this application get removed automatically, and you do not need to delete any leftovers manually. But let us not forget just how many additional applications there might be on your computer. To take care of all the other potentially dangerous programs, you should scan your PC with the SpyHunter free scanner. This way you can be sure that your system is safe and sound. If not, get yourself a decent antispyware application that will protect you from harm. Press Win+R and type Control Panel into the Run box. Select Uninstall a program and delete the unwanted application. Click the Start menu box and select Control Panel. Go to Add or remove programs and uninstall the adware application. Quick & tested solution for MusicCougar removal.